The Milpitas Sports Center is a full service fitness center that offers something for everyone. Our facility includes a 33-piece fitness center, 3 pools, large gym, 2 aerobic studios and locker rooms with showers. New members can take part in a “Fitness Orientation” to learn the proper use of our Fitness Center equipment. All programs are open to participants High School Age (with valid High School ID) and older. Participants under the age of 18 must be accompanied by a parent/legal guardian for the duration of the program or workout. The Sports Center offers different membership options to meet your individual needs. Our program is structured to be affordable and accessible for everyone. Milpitas residents are required to provide 2 proofs of residency at the time of membership registration. Non-Milpitas residents pay an additional non-refundable $50.00 annual fee. Below you will find membership options to meet your needs. Visits are sold in increments of 5 at the rate of $4.00 per visit. Fitness visit packages do not expire and are not refundable. All members must complete a registration form. Unlimited Passes can be purchased at any time, but are non-refundable and non-transferable. Senior rates apply to both Milpitas residents and non-residents. Members are responsible for adhering to all facility and swimming pool rules and regulations. All packages are subject to a transaction fee up to $3.00. 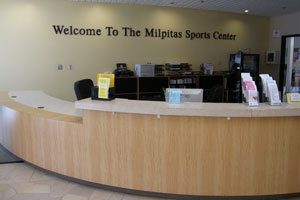 For additional information about the Milpitas Sports Center, please contact the Milpitas Sports Center Front Desk. The Fitness Center is equipped with stairmasters, treadmills, crosstrainers, upright bikes, recumbent bikes and free weights. Participants in high school may become a member with proof of a valid school I.D. Participants under the age of 18 must be accompanied by a parent/legal guardian for the duration of the program or workout. The Milpitas Sports Center has certified personal trainers on staff to assist you in meeting your fitness goals. See the front desk for more information and scheduling. Unauthorized Personal Training is not permitted in this facility. If you are interested in Personal Trainer services, please contact the Front Desk for information.